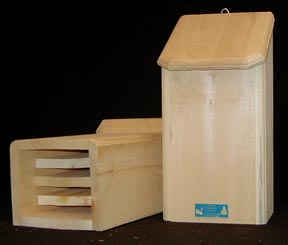 Our best selling bat house accommodates approximately 50 bats and works nicely for a nursing colony. One of our largest bat houses, this one contains 4 chambers. Easily hangs on a fence, building or tree for you to quickly add bat housing to your garden. Bats eat mosquitoes and other annoying insects that are gaining momentum. Read our article for ideas on attracting bats.